Fennel tea benefits in mouth ulcer, IBS, acidity, common cold, gas, bloating, indigestion, flatulence, and other diseases. Fennels contain volatile oils, which give a pungent anise fragrance and slightly sweet taste to the fennel seed tea. 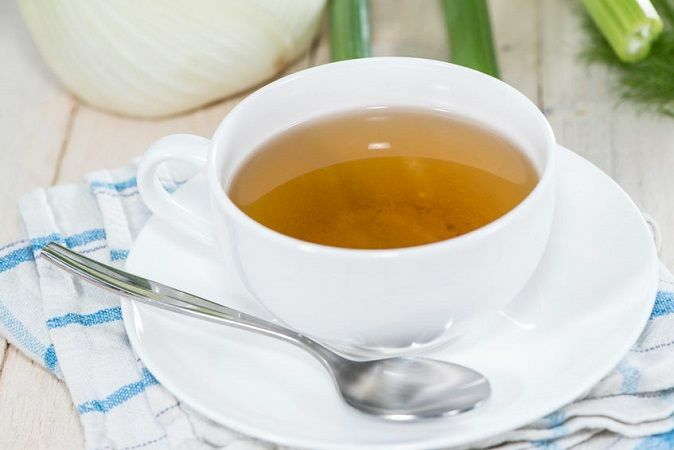 Fennel tea is a strong home remedy for digestive health. It corrects digestion, stimulates the balanced secretion of gastric juices and helps to get rid of gas, flatulence, and constipation. Fennel tea is an herbal tea that boosts immunity. This action of fennel tea is due to its volatile oils and natural phytochemicals. However, it does not provide a good amount of nutrients, but it gives a feeling of freshness and comfort in the digestive system. You can follow the steps listed below to make fennel tea. Take one teaspoon of fennel seeds. Soak fennel seeds into a cup of warm water for at least 30 minutes. Now crush fennel seeds within the same water that is used for soaking the fennel seeds. Boil the water with crushed fennel seeds. Strain the liquid and enjoy a fennel tea. Do not overheat the water with crushed fennel seeds because it may destroy the most important volatile oil present in the fennel seeds. When water boils, then allow to it cool until it becomes comfortable to drink. You can also use fennel leaves and roots for preparing the fennel tea, but traditionally, fennel seeds are used due to their easy availability. Fennel tea has a medicinal value due to which it is famous as in babies suffering from flatulence, colic, and gas. You can also add a small amount of honey in fennel tea. You should not add honey in hot fennel tea. The hot temperature can destroy the nutrients present in honey. Let it become warm comfortable to drink. This way you can also preserve the nutrients of honey. You can also add sugar and fruit juices in fennel tea, but if you wish to add fruit juices, we suggest adding them when fennel tea is cool. Note: Try to prepare a fresh fennel tea because some volatile oils are released into the air when it kept for a longer time. Fennel tea helps in following conditions. A warm fennel seed tea helps stimulate the digestion. Fennel tea has a property of promoting digestion by stimulating gastric juices and balancing their secretions in the stomach. In addition, fennel tea also protects the liver and improves liver functions. It helps the people suffering from abdominal distention, gas, and flatulence. All these effects are due to some volatile oil present in the fennel tea. It alleviates pain and discomfort associated with abdominal pain. Some people complain about a foul smell in stools and flatulence. You can get rid of this problem by drinking a cup of fennel tea for a few days. You can drink fennel tea in diabetes. Fennel tea lowers the blood sugar level and may help to decrease the diabetic complications. Remember, it may also cause hypoglycemia if taken along with modern medicines. Therefore, regularly check your blood sugar level if you are also taking anti-diabetic drugs. Fennel tea improves metabolism in the body, which helps in shedding the excess fat. It is more effective in abdominal or central obesity. In obesity, you may require drink two cups of fennel tea twice a day. To enhance effects of fennel tea, you can add black pepper, long pepper, and cumin in fennel tea. However, the taste of fennel tea will become somewhat pungent due to these ingredients. You can also add lemon juice and honey in fennel tea to boost its action in weight loss. Fennel tea is a home remedy for colic in babies. Research studies also indicate that fennel tea and fennel seeds are effective in relieving abdominal pain, gas, and flatulence and colic symptoms. Fennel tea helps to relax the digestive system and it gives relief from gas trouble in babies. It is safer than dill oil, which is widely used to treat colic symptoms in children. Fennel tea relaxes the intestines and gives relief from general discomfort in babies. It acts as a mild laxative and helps in constipation in kids. Fennel tea improves digestion and increases appetite in babies. Fennel tea is a great remedy for colicky babies and results appear within 15 to 30 minutes. You can give 1 ml to 5 ml fennel tea to babies. Do not give more than 5 ml at a time and more than three times a day. If discomfort still persists, you may need to consult the child specialist. Mothers can drink a cup of fennel tea twice or three times a day. Fennel have galactagogue characteristics, so fennel tea also helps to induce milk secretion. Generally, fennel seeds are used with cumin seeds to increase breast milk. There are also controversies that fennel might not safe in breastfeeding and pregnancy, but fennel has been used for centuries for increasing breast milk supply in India. Using fennel and cumin are advocated in Egypt traditional medicines as well as in Ayurveda. We can conclude that fennel tea may increase breast milk and it is probably safe to use in breastfeeding. Therefore, breastfeeding mothers can drink fennel seed tea. The dosage of fennel tea is as follows. Best Time to Take: For improving appetite, fennel seed tea should be taken before a meal. For improving digestion, it should be taken after a meal. You can also use it anytime for its antispasmodic and carminative action to relieve abdominal pain or cramps, menstrual cramps, and other spasmodic pains. Fennel tea is considerably safe for most individuals when prepared with traditional methods without adding other ingredients. Note: These side effects are more reported with fennel oil and these are listed here to be cautious. Unlike fennel oil, which causes hallucination and seizures in some people, fennel seed tea does not cause these side effects because it contains very less amount of active volatile oil. However, in India, many pregnant women use fennel tea to get rid of acidity, gas, abdominal colic, and nausea or vomiting. The safety and efficacy of fennel tea are not well established in pregnancy and breastfeeding, but it is widely used in Asian countries including India, China, Tibet, and Bhutan. Fennel tea is likely to be safe to consume by lactating mothers. There are no adverse effects reported with the use of Fennel tea in lactating mothers and breastfeeding babies. Note: All side effects are reported with fennel oil or other herbal teas containing fennel. There is no study, which particularly advises to avoid or take fennel seed tea during pregnancy and breastfeeding. Fennel oil is very strong and might have many side effects as compared to fennel tea. I have acidity problem and poor digestion. How much fennel tea should I take to cure this problem? When should I drink it? What will be the appropriate time to take it – before food or after food? 60 ml is the most suitable dosage for fennel tea for an adult. For hyperacidity, it should be taken at least 30 minutes before a meal. Thanks. My main concern is acidity. Which other herbs can I add while making fennel tea that help in acid reflex? We didn’t remove your question. There might be reCAPTCHA error while posting. Yes, you can take fennel and holy basil tea together. These two are common ingredients in herbal and ayurvedic tea. Giving nonverbal autistic 25 yr old male fennel tea daily working great for gas bloating. Can I also give holy basil daily to help with his anxiety OCD not sure if ok to take both daily and if ok can they be mixed together to give at same time. Your help would be deeply appreciated doctors don’t know much about herbal. He is not on meds but occasionally 0.5 lorazepam pharmacist says don’t use holy basil if given lorazepam same day would like to try holy basil for anxiety instead on putting him on Prozac. We have already replied to your first question in the previous comment. However, holy basil interacts with anticoagulant, antiplatelet and pentobarbital. The drug interactions between holy basil and anti-anxiety and anti-depressant pill including lorazepam are not yet well-established. Therefore, it could be better to avoid them taking together.